It was a surprise to many as popular Nollywood actress, Ruth Kadiri revealed that she has never met move star, Omotola Jalade before, she also went further to state that she would love to meet her. 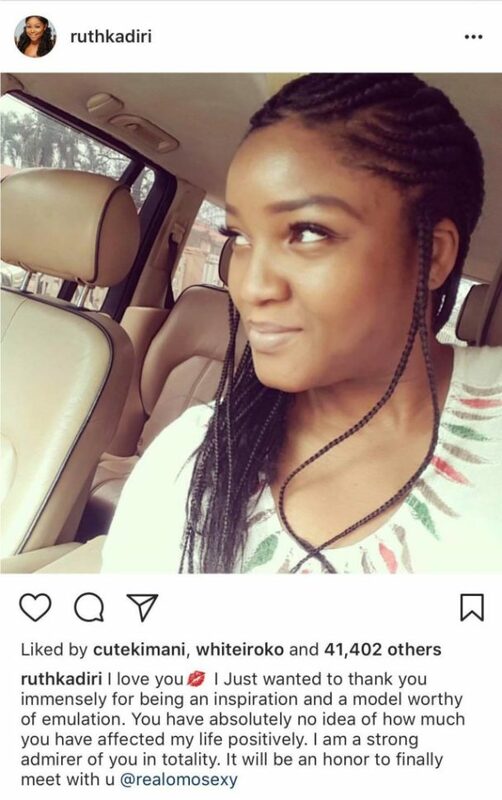 The recently engaged beautiful actress, Ruth Kadiri took to her Instagram page to appeal to, Omotola Jalade to meet her for the first time. Surprised that Ruth in her experience in the entertainment industry for more than a decade has never set her eyes on her, Omotola responded, stating that she would plan a dinner with her, and foot all the expenses. This move has made Ruth Kadiri elated and her fans have awarded Omotola some appraisals over her nice gesture towards Ruth Kadiri as quite a number of people were not expecting the beautiful response which followed the request.